After completing this book, in one sitting, I have so much emotion that I don't even know where to start with this review so let's begin with why I chose to read it. 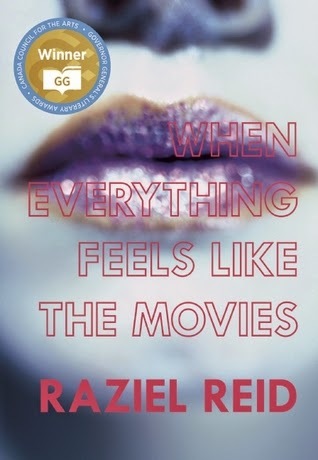 When Everything Feels Like The Movies is one of the five finalists for the 2015 Canada Reads title. A book that breaks all barriers is the theme for the competition. I think it's safe to say that this book breaks a lot of them. The book contains shocking and disturbing moments that are counter balanced with occasional humour and beauty. It's an intense read that I could not put down. Jude is an openly gay youth. This book follows him while he lives his life in a very small town where he is being bullied by his classmates. Despite the abuse that he endures both at school and at home, Jude continues to remain true to himself. He does, however, live on a premise that his life is a movie and the people around him are his supporting cast. I'd recommend this book to anyone that can keep an open mind about individuality as it really is a wonderful read. This is the second book I've read from the Canada Reads shortlist. I'll provide my final thoughts on which one I'll be rooting for, but I have to say, this one is going to be tough to beat. Have you read any of the Canada Reads finalists? Which one is your pick to win? Leave a comment and let me know. I really want to get through the Canada Reads shortlist. I've already read RU and an Inconvenient Indian. I wasn't a big fan of RU but would like to reread it. I'm a huge fan of Thomas King. I'm on that very same mission. With only a few more weeks left, I hope I make it. I enjoyed Ru. I think it was because my parents immigrated to Canada in the 1970's so it was interesting to read about how families of other cultures made their journey. I'm struggling with an Inconvenient Indian. I've tried to start it twice already and didn't get very far. I may have to save it 'til the end. Intolerable is next for me.